Currently under construction at Disneyland, Star Wars: Galaxy’s Edge will allow guests to visit a remote trading port on the edge of wild space, where Star Wars characters and their stories come to life – and where guests will find themselves in the middle of the action. The 14-acre land opening in 2019 will feature two major attractions that put guests in the middle of a battle between the First Order and the Resistance. Each attraction – and even the land itself – will offer guests the chance to immerse themselves in the Star Wars universe like never before. Adds 6,500 more parking spaces in a new structure on the Pinocchio lot just south of the existing Mickey & Friends parking structure on the Resort’s west side, enhancing parking capacity where 80% of guests arrive today. Redesigns loading and access to the Mickey & Friends parking structure to preserve that structure’s queuing while providing access to the adjacent new structure in a way that will significantly accelerate vehicle parking. Eliminates need for redirecting cars throughout the Resort to alternative lots by increasing parking capacity adjacent to Mickey & Friends structure. Reconfigures tram boarding area to enhance the transportation experience for guests parking in both the new structure and Mickey & Friends. 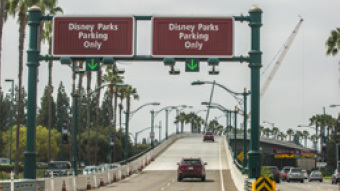 Reroutes vehicles exiting the new parking structure and Downtown Disney to the former tram route situated on Disney’s property, to allow for I-5 access in a way that minimizes traffic on city streets on busy days. 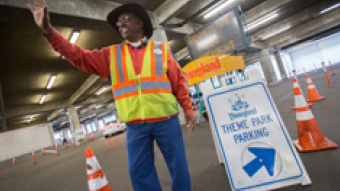 Improves and maximizes guest options on Disney’s existing East side parking lots to create a better balance and mix of guest and cast parking, facilitating better traffic flow throughout the Resort. The Disneyland Resort is more popular than ever and with the addition of Star Wars: Galaxy’s Edge, we are upgrading, improving and adding new parking and transportation improvements long envisioned for the Resort. After a thorough review of our overall short- and long-term parking needs, we are creating an effective and cohesive plan for the overall Resort that will improve flow and prepare for future growth. Increasing by more than 60% the ability to stack cars in the ground-level entry lanes before the parking kiosks. Doubling parking kiosk capacity by providing more entrances and lanes to handle increased attendance and loading. Adding more staffing per parking kiosk to accelerate loading of cars.